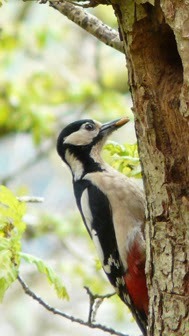 Nineteen months ago I enjoyed watching woodpeckers in Coed y Bleiddiau, next to the Ffestiniog Railway. Oblivious to steam and whistles the parents kept up the relentless supply of food. I mentioned this nest to a fellow walker the following summer, saying we might be lucky and see them there again. He politely explained that they never nest in the same place and recent gales explained their wisdom as the tree lay on its side. 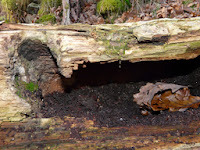 It was a good opportunity to see the inside of an old woodpecker nest; deep with lots of soil and a few worms. Several years ago a good friend gave us an owl box as a Christmas gift. 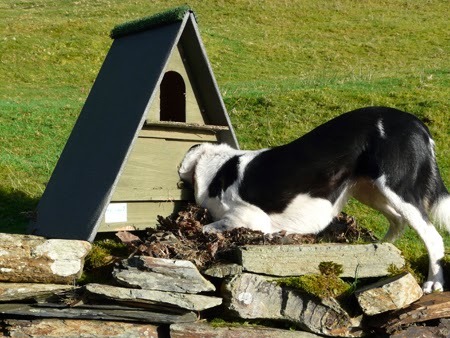 Each new year, just before he comes to stay, I check for pellets at the base of the tree but to no avail. I went to check this December and the box had been blown off the tree. Lots of leaves which could have been blown into the box but the woven grass and moss must have been carried in. 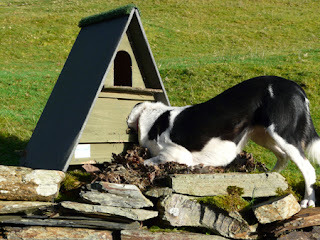 Molly loves squirrels and can spend hours patrolling the base of a lone tree; I think she recognised their scent.